Carlos Alberto GH it’s a 31 years old Mexican painter. He discovered art since he was very young, spending most of his childhood time drawing and painting, putting his works in certain competitions, always having a good answer. In his artistic career, he won lots of local and national competitions and has made around 50 art exhibitions. He also studied the career of restoration and art conservation, working on important projects in Mexico, he is a former archaeological restorer on the Mayan peninsula. But since the street art was introduced to him, he started to involve himself more. 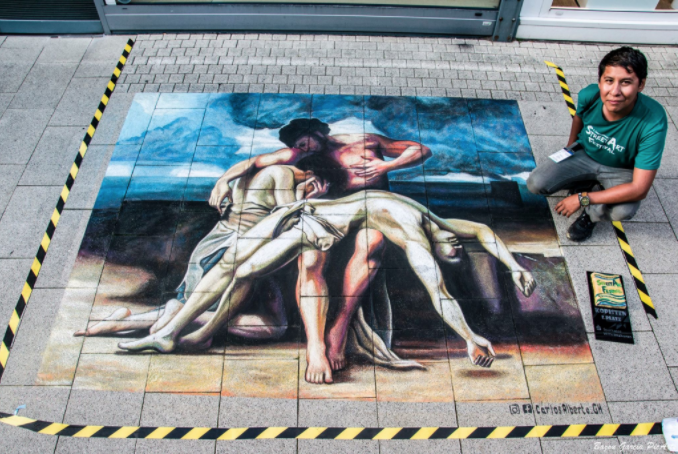 Carlos has participated in international street painting and mural expositions, which he has had some success at, all over the world including in the United States, Cuba, Sweden, Spain, the Netherlands, Germany, Russia and at home in Mexico. Now he dedicates his whole time to work on the streets, also in the making of mural paintings.